In every school there’s one or two children who want nothing more than to cause as much trouble as possible. In isolation, they’re bad enough, but now imagine a crowded classroom of them – now you’re basically picturing the hot hatchback segment. Over the last few years, the number and quality of vehicles attending this class of troublemakers has increased, and right at the back of the class is the suspiciously well-behaved Volvo V40 T5. With scoundrels like the Volkswagen Golf R and Honda Civic Type R causing mayhem up at the front of the class, it’s hard for the mild-mannered Volvo to stand out. The question has to be asked – does the facelifted Volvo even belong in this group? There’s only really one place to start with cars of this ilk, and that’s by asking whether or not it has the right heart to be a hot hatch. A 2.0-litre, four-cylinder turbocharged petrol engine is certainly reason enough to lump it in with the naughty kids, especially as it produces an impressive 245PS. The result of this power is 0-62mph in just 6.4 seconds. As expected, out on the road, it feels suitably fast, but it doesn’t really ever feel all that thrilling. A big part of that empty feeling is the lack of a decent soundtrack; it is a fantastically plain sounding machine for something so powerful. Actually, we can’t help but wonder if it is actually harder to make an engine with this kind of output sound so uninspiring. There is only one transmission option with the Volvo V40 T5 too, an automatic gearbox that is smooth enough but rather uninvolving and not up to the sharper levels of its rivals. Thankfully the Volvo V40 T5 redeems itself with its ride quality, which is firm but comfortable and we’ve found it to be pretty handy on longer drives too. The firm ride also makes it rather good in the corners, and the car will enthusiastically hang on to the tarmac, so that’s all very ‘hot hatch’ as far as we’re concerned. There are of course plenty of other Volvo V40’s in the range that are much better behaved. Indeed, our naughty Volvo V40 T5 is just one of six engine options available. In terms of petrol power, there’s the efficiency-focused Volvo V40 T2 and mid-range Volvo V40 T3 engines, offering around 100PS less than our T5, but better mpg and emissions. 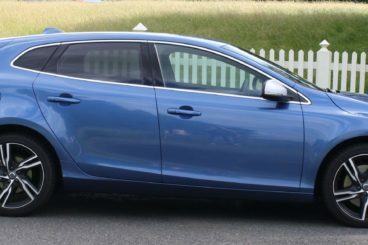 It’s a similar story with the diesels, the Volvo V40 D3 and D4 engines are sensible and acceptably powerful, but if you really want to go all out for efficiency then go for the Volvo V40 D2 – over 70mpg and under 100g/km of CO2 emissions make this impressively frugal. One area where Volvo really excels is this one right here. Clean, convenient Swedish exterior and interior design, and rock-solid build quality. Of course, it’s no different in the new Volvo V40 T5. While the interior design might not be stylish, it is a well-judged layout for a car, and the floating console effect is still a talking point for passengers. Whether you find it appealing, or not, there is no doubting the distinctly Scandinavian feel of the interior – crisp, neutral, and practical. Materials and build inside feel sturdy and tight, you can tell real care and graft has gone into the construction, and we’d bet it holds up well over the test of time, too. That means it’ll handle lots of wear and tear from the kids, because, yes, the Volvo V40 T5 acts as a fine family car, too. That feel of tight, solid construction also transfers to the driving experience, showing how important quality is as an overall trait in a Volvo. The new facelift has really freshened up the image of the Volvo V40, even if it still lacks a bit of design balance. The rear of the car is rather aggressive and angular, while the front is quite smooth and streamlined. Proportionally, it doesn’t quite work. Facelift highlights include new headlights as the standout feature; these are now the LED ‘Thor’s hammer’ design lights that Volvo is rolling out in all of its models. Elsewhere, there are five new colours for buyers to choose from and subtle changes to the grill. Equipment levels in the facelifted Volvo V40 are decent. The higher trim levels probably represent better value in terms of providing equipment as the base models can be a little bare. 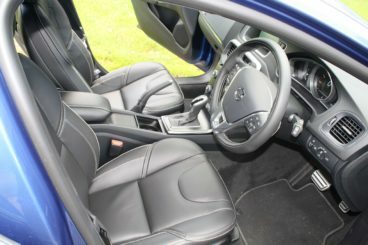 Our Volvo V40 T5 R-Design model comes with parking sensors, climate control, sports seating, sat nav, and cruise control as standard. What makes the Volvo V40 really special is in its safety equipment. The Volvo V40 is one of the safest cars on sale today, scoring five stars and 98 per cent for adult occupants in tough Euro NCAP testing. That will mean the world to anyone transporting their family in the Volvo V40 T5 regularly. It’s even safe for pedestrians, too. This was the car that debuted a pedestrian airbag under the front bumper, promising to reduce damage done to those unfortunate enough to wander in front of the Volvo V40 as it passes by. Of course, Volvo’s collision warning and pedestrian detection systems should stop this from ever happening, but it’s good to know there’s an extra layer of safety there should it ever be required. Touch wood, it won’t be. It’s fair to say the Volvo V40 T5 isn’t a value car. In R-Design trim, as tested, it comes to over £30,000, and however you look at it that makes it a very expensive hatchback. Thankfully, there are finance deals to seek out. Normally, business users wouldn’t be too interested in the Volvo V40 T5, as the economy figures are just not good enough to warrant the car being used as such. However, if you are a business user we found you can get a new Volvo V40 T5 R-Design for around £300 a month with six months upfront. It’s a fairly good deal but will limit you to a strict mileage of just 8,000 miles a year. 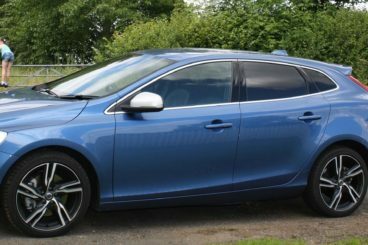 Buyers looking into a Volvo V40 T5 for personal use will find they need closer to £10,000 to get monthly payments down to around £375-400 a month. It’s worth noting that Volvo often runs generous promotions and will seek to make a deal go through, so don’t upset the sales team, you might find they are a useful ally as a deal gets closer. It isn’t the fastest car on the road, and it isn’t even close to being the fastest hot hatch. 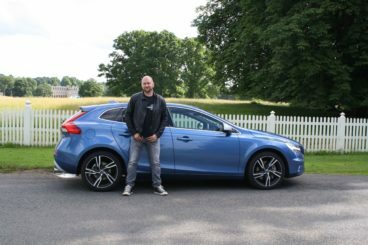 However, there is something very naughty about a wild Volvo, and though this doesn’t set the heart racing as much as one of Volvo’s special ‘Polestar’ branded cars, the Volvo V40 T5 can be driven very quickly if the driver is focused. It feels like you’re doing something you really shouldn’t, and we like that. Volvo only seems to make comfortable cars, and the Volvo V40 T5 is just another one in the stable. The seating is excellent for all passengers – adults and kids, alike. The adjustments for the driver’s seat and steering wheel are impressive, and the ride quality over challenging road surfaces is rather good, too. Over long distances, the Volvo V40 T5 is a faithful friend. It’s safe to say that Volvo just keeps getting better and better when it comes to build quality. While it’s no Bentley, the Volvo V40 T5 feels superbly built and everything has a solid, quality feel to it. Proportionally flawed and lacking a real direction, the exterior of the Volvo V40 just looks a little bit lost. It’s the automotive equivalent of a baggy pair of jeans, teamed with a smart pair of brogues – it just doesn’t look right. The engine might be a little bit spicy, but the soundtrack is flat. It’s certainly not the end of the world, but a little bit of theatre is always appreciated when you’ve got a car that can get to 62mph in under seven seconds. It’s not the most expensive hot hatch on sale, but it is seriously lacking in depth and character to be going up against other fast hatchbacks at this price point. Not many of its rivals can beat it for quality, but it can be beaten on value. Naturally, rivalling cars are usually pretty comparable. Then again, there is quite a bit of difference in character between the Volvo V40 T5 and the two core opponents we’ve picked here. Bavaria is home to the car that poses the closest match to the Volvo V40 T5, and it comes in the shape of the BMW M140i, the replacement for the recently departed – and awesome – M135i. It too, is a hatchback – and comes with three or five doors. It also blends serious performance with sporty credentials, and it comes with the level of quality you’d expect from a premium manufacturer. At its heart lies BMW’s excellent 3.0-litre six-cylinder turbo engine, a real treat in this most modern of eras. Large displacement engines with more cylinders are slowly dying out because of emissions laws, but the clever people at BMW have manged to make a relatively efficient straight-six engine that has earned numerous accolades for its performance and economy – 340PS and an achievable 36mpg. 62mph is reached in 4.8 seconds, and that is furiously fast. It comes with a choice of a manual gearbox, too, and for those who love to feel involved this is the one to have, though the optional eight-speed automatic is one of the best on the market. The deal-breaker for many, though will be the fact that the BMW M140i is rear-wheel drive, and so represents a superior layout for driving dynamics. It drives well, too, with sharp steering and tons of feel through the pedals and seat. It’s playful, but don’t push it too hard, because it can bite. Inside is the usual BMW quality layout with some lovely ‘M-Sport’ touches and the excellent ‘iDrive’ infotainment system. It’s comfortable and roomy, and oozes quality. You have to say, the Volvo V40 T5 really has its work cut out with this rival. Chalk and cheese come together in this rival face off. The quiet, understated styling of the Volvo V40 T5 meets the rally inspired aggression of the Ford Focus RS. Heralded as one of the finest hot hatches ever made, the Ford Focus RS is an all-wheel drive 350PS monster that possesses some of the finest dynamics in the hot hatch class. It terms of performance, it absolutely blows the Volvo away. So, why are we comparing it? It’s important to understand where the money goes with the Volvo V40 T5. 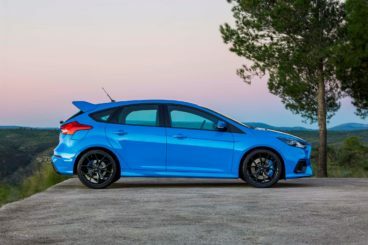 Take a short trip in the Focus RS and you’ll see just how bare and lacking in overall quality the interior space is when compared with its Swedish rival. All of Ford’s money has gone into developing the phenomenal performance, while all of Volvo’s cash has gone into excellent construction, safety, and quality. Both have five doors, practical storage areas, decent equipment levels, and room for driver and passengers, but both go about their missions in totally different ways. If you’re not sure, the chances are you’ll find out what you really want in your hatchback by driving these two cars, and that’s why we’ve put them up against each other. 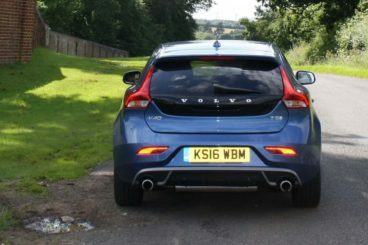 At the beginning of this article we questioned whether or not the Volvo V40 T5 is a hot hatchback, or not. In truth, it isn’t, being trumped for performance comprehensively by both the BMW M140i and the Ford Focus RS. What it is, though, is a very comfortable and rapid ‘normal’ hatchback. The Ford just doesn’t have the overall quality that the Volvo V40 T5 has, and it feels dark and bland inside. It certainly can’t match the Swedish hatch for comfort, either, being geared far more for aggression on the road. 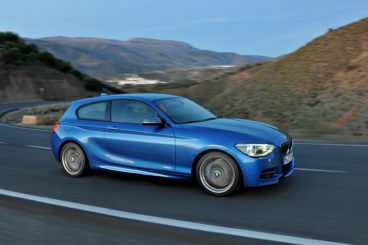 So, that leaves its other rival – the BMW M140i – to swoop in and pick up the victory. It has the luxury, it has the build quality, and it has the exciting performance to eclipse the Volvo V40 T5. It also has one of the finest engines ever put into a hot hatch, so our recommendation is to enjoy that six-cylinder growl while it lasts.